The 55th episode of THE FIRE AND WATER PODCAST is now available for your listening pleasure! THE FIRE AND WATER PODCAST is the official podcast of FIRESTORM FAN and THE AQUAMAN SHRINE. Shag and Rob discuss Aquaman #20 by John Ostrander, Manuel Garcia, and a slew of inkers. Next we dive right into Justice League #20 by Geoff Johns, Zander Cannon, Gena Ha, Andres Guinaldo, and Joe Prado. We also discuss “Villains Month”, some new DC merchandise, and more! We wrap up with another massive dose of Listener Feedback! You can find the 55th episode of THE FIRE AND WATER PODCAST on iTunes. While you’re there, please drop us a review on the iTunes page. Every comment helps! Alternatively, you may download the podcast by right-clicking here, choosing “Save Target/Link As”, and selecting a location on your computer to save the file (42 MB). As always, thanks to my co-host Rob Kelly, Sea King of THE AQUAMAN SHRINE, for doing all the post-production on these episodes! Intro theme, “That Time is Now,” by Michael Kohler. Special thanks to Daniel Adams and Ashton Burge with their band The Bad Mamma Jammas for our fantastic original closing theme! This episode brought to you in part by InStockTrades.com! 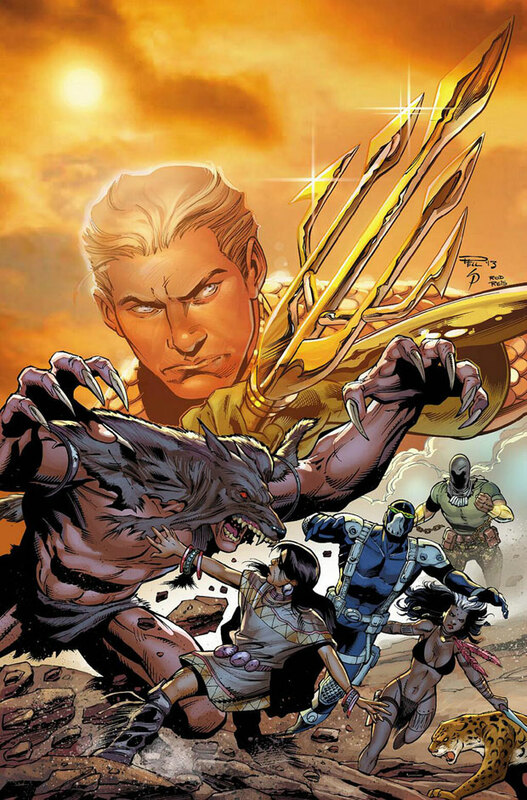 Check out the covers to Aquaman #20 and Justice League #20 below! Posted in: Comic books, Firestorm #10: New 52 v2 (Ronnie/Jason), Geoff Johns, John Ostrander, Justice League of America, Podcast. To answer some of your questions, Shag, NO, there definitely are not enough Batman books coming for Villains Month. DC choosing to spotlight only sixteen of his rogues is a clear indication that they’ve lost faith in his ability to attract readers now that Grant Morrison has moved on. After issue #17, however, the first story arc moved a little too slowly. And by “a little”, I mean “way”. That introductory arc has wrapped up, though, and it looks like the pace will pick up as Ollie has a new mission and direction. Issue #22 should be a good one to pick up if you want to give the series a chance. Also, yes, there is a BATMAN/SUPERMAN series starting in two weeks, written by PLANET HULK-writer, Greg Pak, and drawn by the aforementioned Jae Lee. 1) As a French Canadian, I don’t say the infamous “eh?” at the end of sentences. If I do, it’s only in writing, and only ironically. 2) Hergé is pronounced with a soft “G”, it’s Hair-Jay (but you have to remove the “d” component in the letter “j”. Like in Fabergé eggs. 3) When Rob says “tout de suite”, does Shag see “toot sweet” in his head? Well, Aquaman and Justice League seems to be bringing Rob down. Like him, I have no interest in the Others. Ostrander’s name on the cover might have made me curious though. Marketing fail. Brian Wood’s Conan the Barbarian is the first Conan book since Roy Thomas/John Buscema’s days I’ve been able to read for more than one issue. I love it. I think you’d like Green Arrow, Shag. This opinion is based singly on the fact that I do. C’mon Shag & Rob! Yes there’s a Batman/Superman title coming from Pak and Lee as mentioned by Mr. Drunkula. I heard that issue #1 has already been delayed and is late. So that’s off to a poor start. Artist’s fault? Or another case of multiple last minute editorial changes that we’ve been hearing so much about from DC? While I’ll agree that Justice League #20 has some less than consistent art from Gene Ha, I don’t think that’s indicative of his talent or style to per say. I think Gene gets a raw deal, as Rob mentioned, he seems to be the go to guy in a pinch to fill in on Justice League, unfortunately for Gene, I think those are last minute jobs that are thrown his way on a very short deadline. I don’t think it’s a coincidence that after DC announced the week before JL #20 came out, that it’d have a fill-in team, that Gene Ha announced the next day that he’s taking a year off. I think he’s tired of not being used consistently by DC unless they have a last minute super tight deadline that they throw his way. I think under normal circumstances, his art is pretty top notch, just look at all of the great covers he did on Adventures of Superman back around 04 and 05. I would say his work has gotten even better since then. I agree that a lot of the New 52 has a very generic art feel to it, and I think that one way to solve that would be to give Gene Ha a regular book to star on and bring his great style to, unfortunately that won’t be the case anytime soon. I share Rob’s sentiments, I too am finding myself not enjoying some of the comics I traditionally read, not so coincidentally I find that to be the case pretty much only on the DC books I’m reading. I continue to see my once giant DC pull list dwindle due to books I like being cancelled, and the other books being completely bland. I have been loving IDW, Dark Horse, and Valiant stuff I’m reading. Brian Wood’s Conan is awesome, it is my favorite series I’m reading, glad you’ve picked it up and have enjoyed it. I highly recommend looking into Brian Wood’s series The Massive as well from Dark Horse. It’s a great environmental book. I’d also check out Brian Wood’s Star Wars series as well. Pretty much Brian Wood is the man. And yes Kurt Busiek’s run on Conan was pretty awesome as well. I highly recommend picking up the “The Frost Giant’s Daughter” tpb, which is the first arc of Busiek’s run with absolutely gorgeous art by Cary Nord. Great show as always guys, thanks for making my Monday at work less mundane!! And now you have trashed Robotech on the show (Rob!!!!). You are slowly working your way through all things awesome and good. For shame. For shame. After spending 6 hours in lock-up for attempted arson with a big greasy guy named George who kept trying to get me to hug him and squeeze him and call him by his name, combined with your continual hating of all my childhood favorites, I am starting to think this show is bad for me. But I’ll probably keep listening, because things that are bad for you are good, right? Well, off to smoke a pack of cigarettes and drink some tequila while chomping on a few KFC Double Downs. If I don’t comment on the next episode it’s because I am dead. Shagg and Robb, Let me chime in on the hottest Legionnaire debate with my thoughts… I’d say it would have to be… WILDFIRE! Quite laterally they don’t come any hotter! I really love Gene Ha’s work so it is surprising to hear Rob’s thoughts. His work has a sort of raw feel so it needs the right story to complement. His stuff on the Project Superman Flashpoint mini worked perfect for that story. And I highly highly recommend Action Comics #9 by Morrison and Ha as a single story commenting on Superman, creator rights, and commercialism. I also love Alan Brennert’s stuff. The Detective Comics #500 story is great. But, of course, ‘Should Auld Acquaintance Be Forgot’ is perfect and cherished by Supergirl fans. (If interested, my look at the story here: http://comicboxcommentary.blogspot.com/2010/12/back-issue-box-christmas-with-super.html) I have heard that Mark Waid got in trouble from DC by letting that story slip through in his role as editor. I understand Rob’s feelings when talking to Brennert. One of my comic book heroes (and I wonder the response this will get) is Howard Chaykin. A couple of years ago at the Boston Comic-Con he was sitting alone at his table and I sat down and talked to him for about 20 minutes straight about comics and his stuff. It was spectacular. Lastly, I will echo the love for Wood’s Conan. Crisp quick stories with an ongoing theme exploring the Conan/Belit doomed relationship. The first arc, with art by the Becky Cloonan, is near perfect comic story-telling. Shag, did you call Rob the “Iron Monger” because both he and Obidiah Stane are bald? I liked Aquaman #20, even if it was a “backdoor pilot” for The Others. This would have been a “Showcase” or “First Issue Special” issue back in the day. The team is still interesting to me and there is a lot of potential for a sort of super-secret, non-Justice League team in the current DCU. The new addition is interesting, although the team is still down a member since there has not been a replacement for Vostokk yet. From a real world perspective, it was also nice to see John Ostrander getting work right now, to be honest. Shag, you do realize that Rob Liefeld hadn’t worked on Hawkman in the better part of a year, right? Tom DeFalco wrote it as an 80s style superhero book and it was really pleasing to read, much like Jurgens stuff on Firestorm. At least I’m getting thrown a bone in the form of DeFalco writing the Shadow-Thief book in Villains Month, which is appropriate as he created her in the pages of Savage Hawkman. Jurgens is not writing the Killer Frost one, unfortunately, but Sterling Gates is a nice choice too. 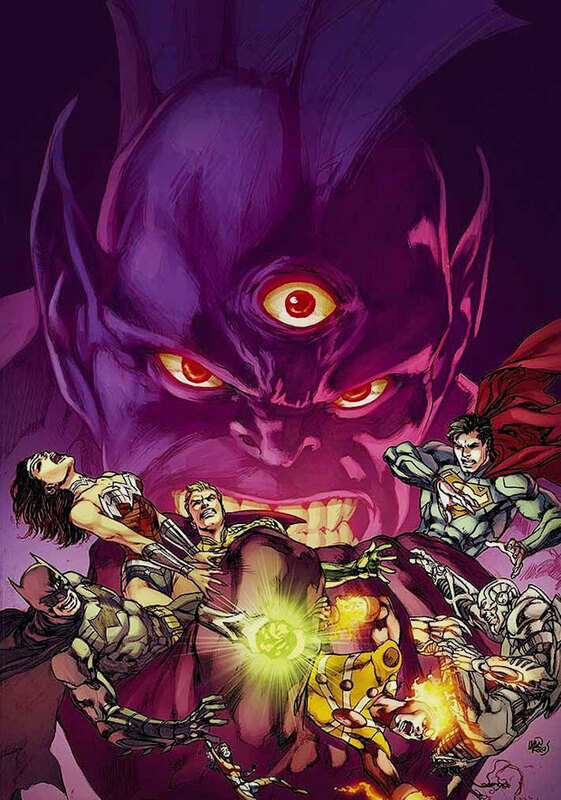 And the Eclipso book by DiDio and Tan should be awesome… everything they have done together has been great. Did you guys actually read Green Team #1? You should try it, because it is once again that elusive “something different” which everyone constantly clamors for but never buys. After all it’s not another freaking Batman comic. Luke, isn’t Stormwatch ALREADY the DCU’s super-secret non-Justice League team? I don’t think Luke is commenting on Green Team as an alternate super team to contrast the JL, I think he’s saying as a whole it is a refreshing new style book in a New 52 Universe that we’ve seen become very generic in feel, as well as look (as Rob touched on this episode). When New 52 launched it was very diverse, we’ve seen a lot of those great diverse books cut now and replaced with stuff that “sells well” which consequently means its got the same generic feel as the preexisting books that are okay sales wise. I’ve been sad to see books like Resurrection Man, Firestorm, Blackhawks, GI Combat, and now Dial H, Demon Knights, and Legion get the axe. They were all a different type of book that a lot of the others, and now they’ve all been cut. He actually said that about the Others. I completely agree that the Green Team is a fun, offbeat book with lots of potential. Can’t be bothered with the Others though. Ahh sorry I misunderstanding what team you were talking about in your post. I agree I’m a little sick of The Others at this point. It would be nice to have Aquaman back in his own book. I really wish DC would have an anthology style book in the vain of Action Comics Weekly (but not weekly, stick to monthly) that had multiple short stories in it. I think that’d be a great way to test the waters for new character ongoings as well as keep heroes whose books were cancelled still prominent in the DCU. This sort of book would be a good choice for a story on the Others as well as some solo tales for characters like Firestorm, Booster Gold, Deadman and/or Martian Manhunter who don’t have their own ongoings.They could call it Showcase and it’d be a very welcomed book I would think. I’m all for a Showcase anthology book, but I don’t know if DC would see it as a good investment. After all, they tried it most recently with Our Greatest Adventure (and whatever the preceding mini was called) and nobody but me remembers the awesome New52 Robotman it spawned. On a monthly basis, DC Universe Presents was a Showcase type book (just not an anthology) and that was recently cancelled. I liked the My Greatest Adventure and Weird Worlds recent anthologies … but more because nobody but me remembers the awesome Tanga comic it spawned. Part of the problem with those books (and the DCU Presents) is that they were built on the 6 issue story model. That’s not a showcase, it’s a commitment. They should make it in the model of 1st Issue Special, throwing new stuff and old characters in one-and-done stories. See if anything sticks. I know DC Presents didn’t do well and I think a lot of that was format. You had 4 to 5 issue arcs in some case which are doomed to fail if its a character with limited following. You make it an anthology book that could appeal to say Martian Manhunter fans, Firestorm Fans, Adam Strange Fans, etc and you have multiple comic demographics buying one book. A lot of stuff has been a big miss in the last 3 waves, I’m not sure what they have to lose at this point trying something truly New compared to the other stuff their producing right now. Maybe, but I’ve had qualms in the past about getting a book for 8 pages of something I like, when I dislike or don’t care about the remaining 16. These days, most people think with their wallets. I remember both Weird Worlds AND My Greatest Adventure, and the awesome Tanga, Garbageman, and Robotman stories they spawned. Lobo wasn’t bad either. But the problem is that those two books existed primarily as a showcase for Tanga and Garbageman, both of which I doubt will ever be used except by their respective creators (Kevin Macguire and Aaron Lopresti), and were never “really” part of the New 52. @Siskoid, Yeah, I guess Stormwatch fills that role, but I have never read an issue of it in any incarnation so I really couldn’t tell you much about it. Same goes for the Suicide Squad. So I guess I really don’t know what I am talking about on that front! I still liked Aquaman #20 anyway. As far as offbeat DC books, I also recommend The Phantom Stranger. Rob will probably balk at it, but the book has been reading like a Vertigo title and is a compelling and full read month in and month out. 2) I’m so glad Rob got to meet Alan Brennert. Not wanting to steal Rob’s thunder, but I too had the pleasure of Mr. Brennert’s company for lunch back when I lived in California. I wrote to him and told him how the 1980s Twilight Zone episode “Her Pilgrim Soul” had inspired me to write my first musical for community theater, which in turn got me into music school as a music major. He was quite tickled by that, and since I already lived in southern California, it was easy for us to hook up. “Her Pilgrim Soul” in my opinion is the very best episode of any Twilight Zone series in all its incarnations, and that’s saying something. I also think it may very well be one of the finest pieces of fiction ever aired on commercial television. I also recommend his other Hawaiian-based novel (other than “Honolulu”) called “Moloka’i.” I thoroughly recommend it; I couldn’t put it down. 3) A few months ago, I pointed out an error that Shag had made in referring to Multiplex’s alter ego as “Dalton Black.” In the original series run, his name was “Danton Black,” not “Dalton Black.” Shag graciously acknowledged the correction on one of the podcasts. However, I should note that under the pen of Dan Jurgens, the alter ego of Multiplex is now officially “Dalton Black.” It suggests to me that Mr. Jurgens may very well haved relied on this site and/or the podcast for some amount of research! 4) Put me down as another supporter of the concept of reviewing the 80s run of Firestorm. As much as it’s been fun to review the new issues as they come out, it’s the 80s run that was such an integral part of my childhood. I look forward to hearing the Shag and Rob take on this classic run. I think going back to it, we’ll all be amazed at how much story was once packed into a comic book, back when comic books considered themselves to be an actual form of literature rather than research-and-development storyboarding for the television and film industry. 5) Is Martin being currently bald supposed to suggest that he is now the DCU’s Professor X? I completely agree with the sentiment that comics need the “something different” and that “not another freaking Batman comic” would be welcome. But I think the concept behind the Green Team is appalling and I won’t be trying it out. I won’t say much more than that. Given some of the things I’ve said in the past, you can probably imagine why. I hope that’s vague enough to survive moderation and to not start a fight.